On our trip back from Canada a few weeks ago, we had a layover in Washington D.C. Instead of just taking the 2-3 hour layover and heading back to Colorado, we decided to make a weekend of it and actually stay in D.C. for a couple days. Since neither of us had ever been there, it was the perfect opportunity to see the capitol! Granted, we really only had one day to see it (our flight got in late Friday evening and we flew out EARLY Sunday morning). So Saturday, we put on our walking shoes and set out to see everything we possibly could in just one day! 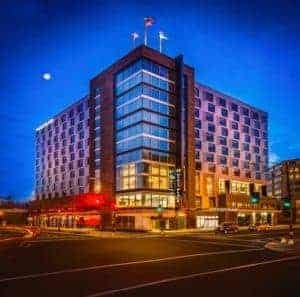 We stayed at the Hyatt Place Washington D.C./National Mall, so we were pretty close to many of the historical sites we wanted to visit. 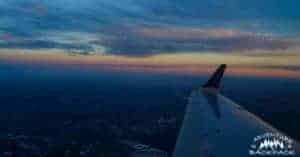 The hotel was just a quick Uber ride over from the Reagan International Airport where we flew in. It was a pretty new hotel and the staff was very friendly. The night we flew in, we ordered food from the restaurant downstairs and brought it back to our room. Oddly enough, they don't offer room service, but you can easily call in your order, go pick it up and take it to your room. They were very accommodating of my dairy allergy as well and ensured me that I should not get anything off of their pre-made deli options, but to order it with them and they would make it with no cheese or dairy based condiments. And it was the same price as their pre-made options. Quick note about Uber that we had never experienced: apparently, there is an option during high-demand times that allows you to car-pool with other riders. It apparently defaults to this option during high-demand times, so we were automatically placed in a car-pool. Luckily, the Uber driver had a large SUV, otherwise all 4 of us with our luggage would not have fit. The other riders were not aware of the car-pool option either, so we were all very confused. It turned out fine though, and we all spent less money on the ride! Our Route Through Washington D.C. Since there were tons of sites that we wanted to see, we set out early in the morning. Our first stop was to the Library of Congress, since it opened at 8:00am. We set out from the hotel and immediately went the wrong direction – lesson learned not to allow Nate to navigate! Navigation is my job! So, once we realized our mistake, we turned around and headed in the correct direction. We had only gotten a few blocks before realizing our mistake, so it wasn't a huge deal. On our way to the Library of Congress, we stopped at the Capitol to take some pictures. They were doing construction there, but it was still beautiful. Our general plan was as follows: Library of Congress, Capitol Building (outside only), Supreme Court (outside only), Smithsonian Museum of Natural History, FBI Building, International Spy Museum, Washington Monument, Lincoln Memorial, White House, Arlington National Cemetery, then take the metro or an Uber back to the hotel. This was our plan, and we generally stuck to it… sort of. This was our first stop, but we could have easily spent all day here. It was such a beautiful and historic site, and so full of information! Coming into the building, you do have to go through a metal detector and scan your bags, but they were really simple and nice about it. 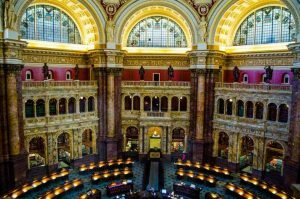 There is still a ton of research that goes on at the Library of Congress, as it is the official research library to the United States Congress, so it is respectful to be as quiet as you can. It is still a library! 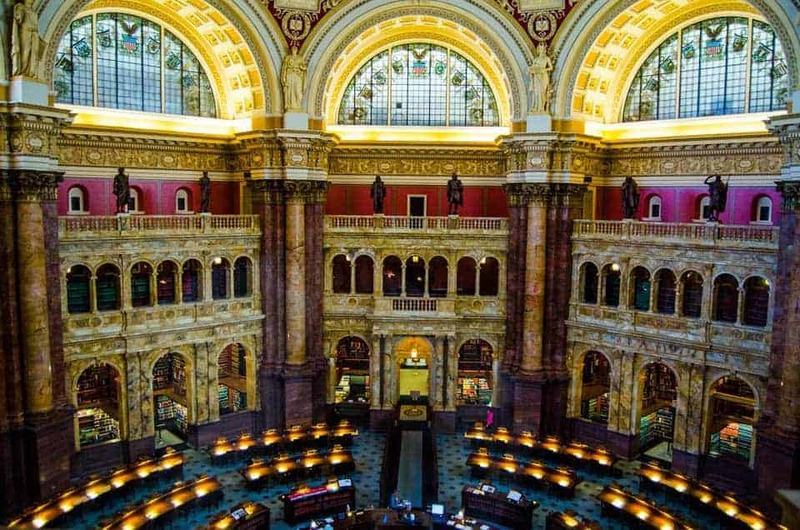 Thomas Jefferson's entire personal collection of books is housed in the Library of Congress. 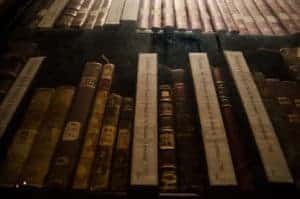 There are some books that have gone missing over the years, and some that are exact replicas of his original library. The books in this collection are color coded to show which are originals, which are exact copies, and which are still missing entirely. After the Library of Congress, we took some pictures of the Supreme Court before heading on to the Museum of Natural History. To be completely honest here, this wasn't what I was expecting. I was truly hoping for more history of the planet, history of evolution, culture, etc. We did find a very interesting exhibit called the Hall of Human Origins, but there was much more just general things you would find at any local museum. We read about several other exhibits that were more geared toward what we wanted, like the African Voices and Hall of Geology, Gems, and Minerals, but we never were able to locate them. Perhaps we would have enjoyed it more if we had more time to look around. It also didn't help that there were so many people in such a tight area, and I get very antsy around that many people. 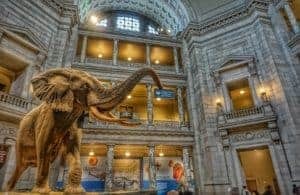 The Smithsonian Museum of Natural History is free admission and is open year round except Christmas Day. It is the most visited museum of all of the Smithsonian Museums, which is perhaps why I was so antsy visiting it. This museum includes the largest group of natural history scientists in the world, consisting of over 180 natural history scientists. After we left the Smithsonian Museum of Natural History, we headed toward the FBI Headquarters. They were closed for the day since it was a Saturday, so we couldn't go in. Outside, the building just looked like any other building, so we moved on. We headed toward the International Spy Museum, which we hadn't really planned on going to but saw it on the map last minute and thought it would be cool! It was just down the street from the FBI Headquarters, so we walked over. Unfortunately, since it was a last minute addition and we didn't look into it, we got there and found out it was $25 per person for entry. Nah, we just wanted to peek around, so we decided against that one! After two busts, we decided it was time for lunch at Gordon Biersch. The International SPY Museum. This is pretty much all we saw of it! Refreshed after lunch and a beer, we made a quick alteration to our plan when we realized we hadn't included the National Archives! 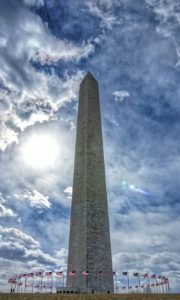 It was on our way toward the Washington Monument anyway, and we would have regretted not seeing the original Constitution, Declaration of Independence, and Bill of Rights while we were in Washington D.C. Going into the National Archives was the most security we had to go through all day. I guess we can thank Nicolas Cage for that (haha)! It is free admission, though, so you just have to go through the security and then you are good to go. I have to say, I'm so happy we made this last minute change. This was another place we could have spent all day looking around. There is so much history and original letters, documents, etc. housed in the National Archives. But, our main goal in going was to see the Constitution, Declaration of Independence, and Bill of Rights, so we did have to blast past most of the other exhibits. Getting to the main Rotunda, we stood in line for about 15 minutes to be able to see the documents. They let you in in groups of about 50 people at a time so that it doesn't get over crowded. Once inside the Rotunda, the Constitution is directly in the center, with the Declaration of Independence on the left and the Bill of Rights to the right of it. The lighting is very dim, approximately .9 footcandles at the actual documents, in order to preserve them from light damage. One footcandle is the equivalent lighting to one candle at one foot away. No photography or videography is allowed in the Rotunda, again, to preserve the documents from a stray flash. Even with these preservation techniques, the documents have faded substantially. 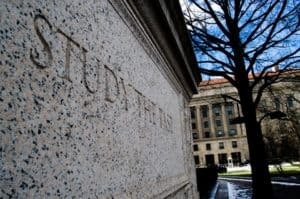 The Constitution was faded to nearly unreadable, although the Declaration of Independence and the Bill of Rights were still in good enough shape to read mostly. Seeing these documents in person is something that I truly feel that every American should have the opportunity to do. It was very interesting and chilling, almost, to see in person what the men and women of our country's past fought for and accomplished. I highly recommend it! 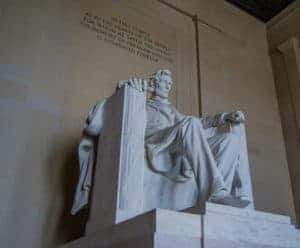 After heading out from the National Archives, we set over to the Washington Monument and then to the Lincoln Memorial. We took pictures and enjoyed the history, but there were tons of people (again, it was a Saturday), so we didn't spend too much time. We were also starting to run low on daylight and we really wanted to see the Arlington National Cemetery. 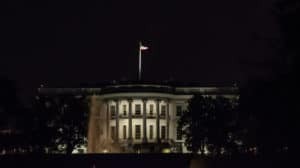 Our original plan was to go to the White House next, but since we were running low on time, we thought that the White House would still be pretty cool to see after dark, with it all lit up. 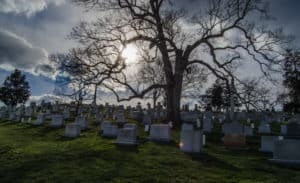 So, we altered our route again and headed straight over to the Arlington National Cemetery. By this time, we had walked probably a good 7 miles, and we were starting to feel it. Walking across the Arlington Bridge was perhaps the hardest part, since there was not much to see and it was WINDY! I'm not talking breezy, I'm talking, ‘hold onto me, Nate, I'm going to blow away' windy. Just crossing that bridge was a feat in itself! Once we got to the cemetery, we got a second (or third or fourth?) wind, as it was so chillingly real to be there. Walking past all of the tombstones of fallen soldiers was heart-wrenching. We went to pay respects to the grave site of John F. Kennedy, and then we went up the hill to the Arlington House. 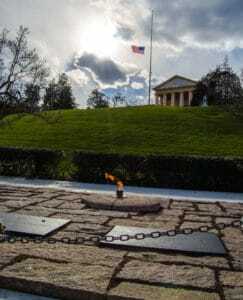 Eternal Flame at the Kennedy grave sites. Standing at the Arlington house is chilling. 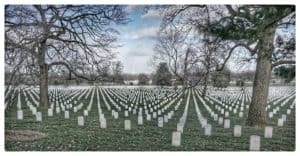 You can see the vast 624 acre cemetery with the tombstones of our fallen soldiers, and in the background, you can see the nation's capitol, Washington D.C., where the hard decisions were made that affected the fallen soldiers' lives. It's a somber feeling. Finally, we made our way through the streets and sidewalks to the Tomb of the Unknown Soldier. Again, such a chilling memorial of those lost who were never identified. 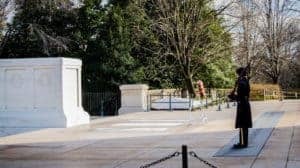 The Tomb Guards, who stand watch over their fallen brothers 24/7, are members of the 3rd Infantry Regiment, also called “The Old Guard.” The Tomb Guard has a very meticulous routine he follows while watching over the graves. After leaving the Tomb of the Unknown Soldier, we decided to head back towards Washington D.C. and grab some food and a drink before heading to the White House for our last stop. We took the metro line back into the city near where we needed to be and where there were several restaurants. 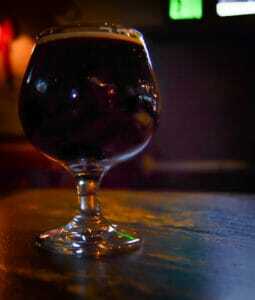 No Beer in Washington D.C.? 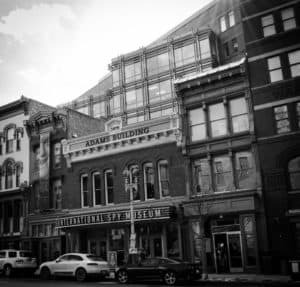 I would have never thought finding a beer and some food would be so hard in such a large city, but alas, Washington D.C. was full of surprises! Getting off the metro, we found a local pub that looked pretty interesting and headed there. Closed. It was 5pm on a Saturday, why was a pub closed? So we thought maybe they were going out of business, and went on our way towards the next pub. Closed… And the next? Closed. We tried 4 local pub/restaurants before finding one that was open! We probably walked a good 2 miles back and forth looking for them as well. Mind you, every McDonald's and Subway were open, but no actual restaurants. So we finally found a pub, whose name is now escaping me since we searched so long! We sat down and the bartender got our drinks for us. We waited a good 10 minutes before we finally had to flag him down again (we were two of about 6 people in the whole place, he wasn't busy) and ask if this place served food. He reluctantly gave us menus and we ordered. At that point we were tired and starving and didn't want to chance leaving, even though the service wasn't good. We got our food and asked the bartender why there are no restaurants open in this city. His response was unconvincing. What's a girl gotta do to get a beer in this town?! Since we were in the “business district,” there was not enough business on a Saturday to be open. They were mainly there for happy hours for the businessmen and women. I found that hard to believe, considering the “business district” of Washington D.C. is also the tourist district, and every McDonald's and Subway was packed full of people ordering food. I would be willing to bet those people would have paid a little more on a Saturday night to have a decent meal at a pub while on vacation. Maybe that's just the observant business person in me, but I would've given it a shot. Of course, their bar was very dead, but we also walked around forever trying to find it! 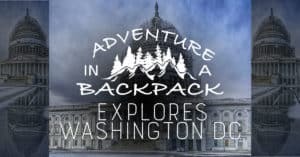 So, if anyone is in the restaurant business and looking for an easy spot with no competition, open a decent pub in Washington D.C. near all of the historic sites so that tourists can grab a drink. Even when we got back to our hotel, the hotel bar and restaurant was packed! The mall that was just a block or two away from our hotel was COMPLETELY closed, even their bathrooms were locked, even though the doors into the mall were not locked. Odd, in my opinion. With as many people as were around the city that night with zero options for food and a beer, I was baffled. No wonder our government is so uptight; they can't find a beer!! After finally warming up and a few beers and wings, we headed out to our last stop: the White House! It had gotten cold and we were frustrated after the lack of pub incident and we were very close to saying “forget it” and heading back to the hotel. But, how can you got to Washington D.C. and NOT see the White House? So, we went. We went around the back at first, and that was pretty uneventful, as the fence was too high to get any good pictures through. Going around to the front, we were able to see it better, but the fences were still very high. I decided to stop and try out a picture with the crystal ball. The crystal ball is just that, and when you take a picture of something through it, it magnifies and warps it like a fish-eye almost, and makes for a pretty neat shot. You have to be pretty close to your subject, though, and I was not. So I didn't get any good pictures with it. However, we did get a good story! As Nate and I are walking down the street in front of the White House, there are obviously cops patrolling everywhere. I stop right in front of one of them (not really thinking about the cop), pull off my backpack, and start getting my camera set up. The cop looks at me like I'm crazy and starts walking over. He casually asks Nate what it was that I was pulling out of my backpack, and Nate fully took control of the situation. He explained to him what it was and what I was trying to do, and he even showed him a picture that we had taken with it in Quebec City. At that point, the cop was more interested in the pictures, so all was well. I thanked him and told him to have a great evening before we headed off. Since we were so far away, we really couldn't get any truly amazing shots of the White House, but that wouldn't have been different had we gone in daylight, so I'm glad we made the decision to go to Arlington instead. That was well worth the extra walking. We headed back to our hotel via the metro line and immediately went to bed. Our flight left at 6am the next morning, and I was batting 1000 at getting selected for TSA searches that trip. So we planned to be heading out of the hotel by about 4am. Whew! We had an amazing trip in Washington D.C., and we were very happy we made the decision to wrap up our Canada trip with this little stop-over. We got back into Denver Sunday morning and headed back into the mountains to Backpack. This will probably be our last flying adventure for a while! We are ready to hit the road and enjoy our road trip adventure, hauling our home and our pups with us everywhere. 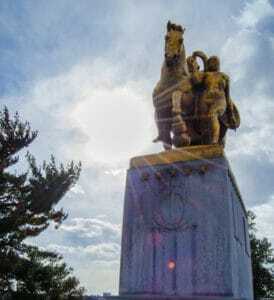 This was a long post, and I hope you enjoyed it and learned something new about our nation's capitol. Subscribe below for all of our new posts and check us out on Facebook, Twitter, Instagram, Pinterest, and Snapchat (@adventure_pack)!